A slate of 28 candidates led by Mayor Tim O’Brien will seek endorsements for city offices at the Democratic Town Committee (DTC) on Thursday, July 18th, 7 p.m. at New Britain City Hall, 27 West Main Street. A nominating committee will provide the 51-member DTC with a report on incumbents and newcomers seeking endorsement, including their views on key issues facing city government in the next two years. The endorsement meeting is set to endorse candidates for single-seat offices including Mayor, Town and City Clerk, Tax Collector and Treasurer. Fifteen Council seats at the at large and district levels will be chosen; three for Board of Education, two for Board of Assessment Appeal and four for Constable. Democrats will endorse municipal candidates at City Hall, July 18th. In a party platform based on candidate feedback and Town Committee issues meetings this year, Democrats are expected to focus their campaign on new investments in education, job creation through transit-oriented and business development and safe, sustainable neighborhoods through effective code and anti-blight enforcement. Mayor O’Brien and other candidates cited the importance of those priorities in discussing their candidacies with the DTC nominating committee. 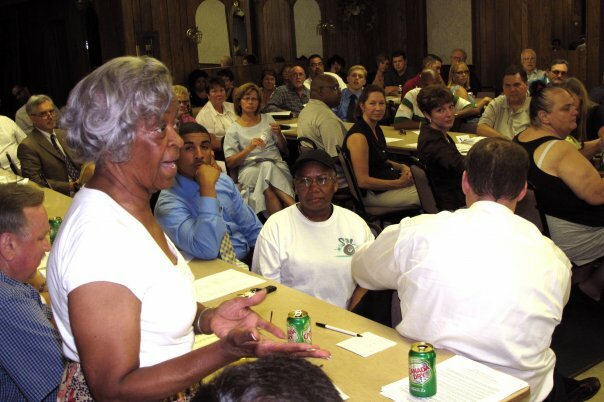 Alderwoman Eva Magnuszewski stated “quality education is a right not a privilege.” She stressed economic development involves branding our city as the place to bring your business and said city government needs to continue efforts at removing blight in neighborhoods. Council President Mike Trueworthy, a member of the Council since 2003, emphasized his work on budgetary matters and the need for infrastructure improvements. He also cited sound economic development strategies and funding for education as his priorities. New Ward 4 candidate, Attorney Adrian Baron, said his work on the Council would involve completion of the Broad Street streetscape and promotion of Little Poland; development of the downtown district, attracting new business to the city and improving the schools. A “Summer Soiree” will be held in support of the re-election of Mayor Tim O’Brien Sunday, July 14th, at the historic (1786) home of Adrienne Benjamin & Steve Horowitz, 288 Steele Street, from 3 to 5 pm. The backyard party is an O’Brien for New Britain committee event. There is a suggested donation is $25. New Britain’s Playeros softball team welcomed a team from Santa Isabel, Puerto Rico on July 13th for a game at Osgood Park. Members of the Merengueros squad are greeted by Mayor Tim O’Brien and DTC member Isabelita Cancel of Playeros and the DTC. 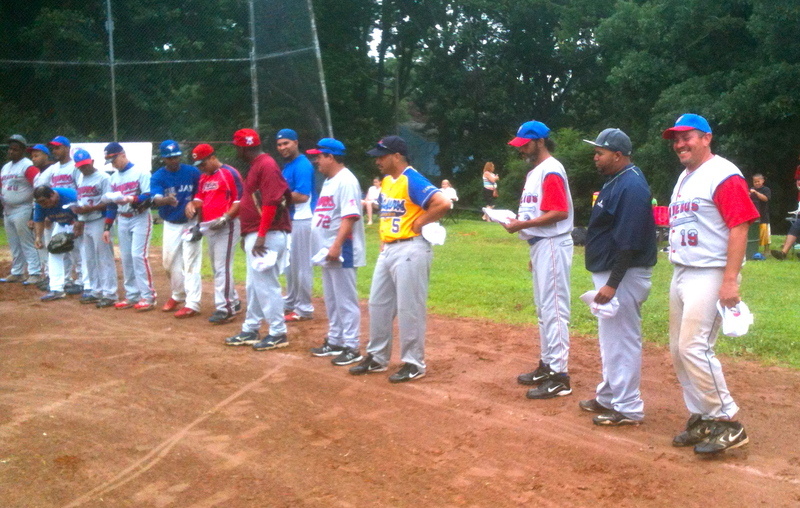 The line up of New Britain’s Playeros team are introduced before the softball game with Merengueros. 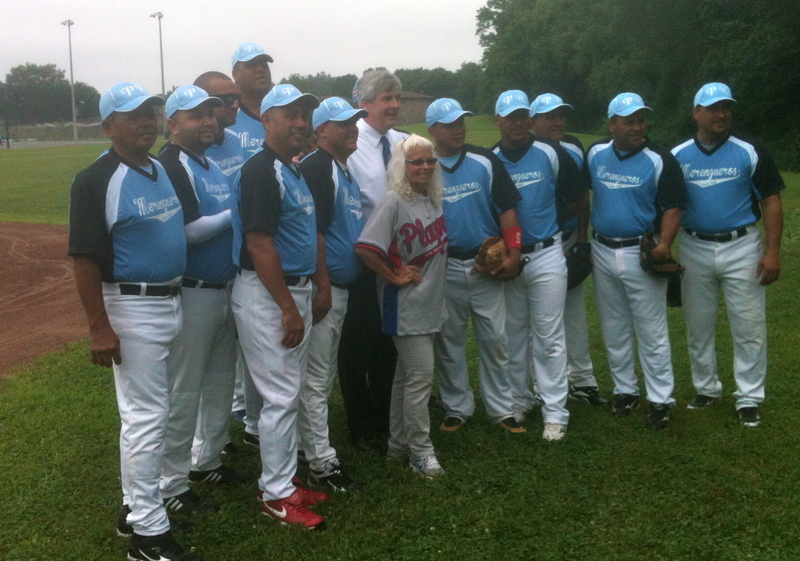 Playeros will travel to Santa Isabel, Puerto Rico as part of a friendship series. This entry was posted in Endorsements, Meeting/Event, Tim O'Brien, Weekend Update. Bookmark the permalink.